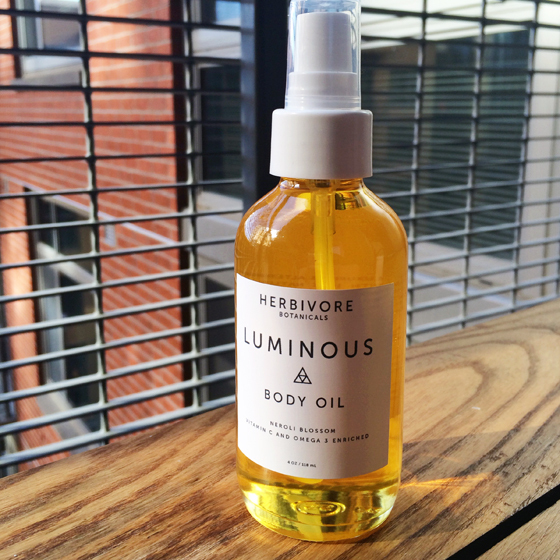 Herbivore Botanicals describes their Luminous Body Oil in Neroli Blossom ($32 for 4 oz.) as “summery,” and that was enough to sell me. I had no idea what neroli was when I discovered this body oil, but if a scent can get me in the summer state of mind, let’s just go on and bathe in it, shall we? While I can’t say that this simple and beautiful bottle of body oil comes with an ice cold shandy and sunglasses, I can tell you that it applies smooth and slippery, even on dry skin, which I love. It glides easily over the body, moisturizes very well (even on elbows, if you use a little extra) and absorbs quickly without leaving a greasy feel. Apricot kernel, golden jojoba, organic rosehip and vitamin E oils all provide nourishment and moisture to the skin. Man, I am on a rosehip oil kick these days…! I love the way it feels, and whether in a facial serum or a body oil, it is so easily massaged into the skin. And yes, the scent is spot-on summer in a bottle. I LOVE it, and it’s so unique. It’s subtly sweet with a heavy dose of spice, and conjures images of Wayfarers, hazy days and short-shorts. Neroli (or orange blossom) brings the floral scent, and grapefruit essential oil also provides a bright, sharp note. The overall summery sweetness is a little bit reminiscent of Fruit Loops – I’m hesitant to write that because I recently likened Osmia Organics’ sweetly scented spot treatment to Fruit Loops, too. Do I have broken scent receptors that mistake essential oils for sugar cereal? !…I will work on my scent vocabulary and try not to write these entires while hungry anymore. The body oil is also available in Egyptian Jasmine - which I almost bought! - Ylang Ylang and Vetiver. Uh, this mask ($34 for 2 oz.) is powerful. Holy crap. After I mix up and apply this dark knight to my face, I can literally see the dirt on my face lifting off my skin. It’s like holding a magnet over metal filings, except the mask is the magnet and the gunk on my face = the filings. WHAT. AWESOME. I suppose it could also be the powder particles, but I noticed that this phenomenon was happening over the “trouble” spots on my face. Either way, a cool effect! We formulated this to be a concentrated mask that can be freshly mixed up quickly before each use rather than a traditional wet mask that has been pre mixed with water and steeping in chemicals and preservatives prior to use. 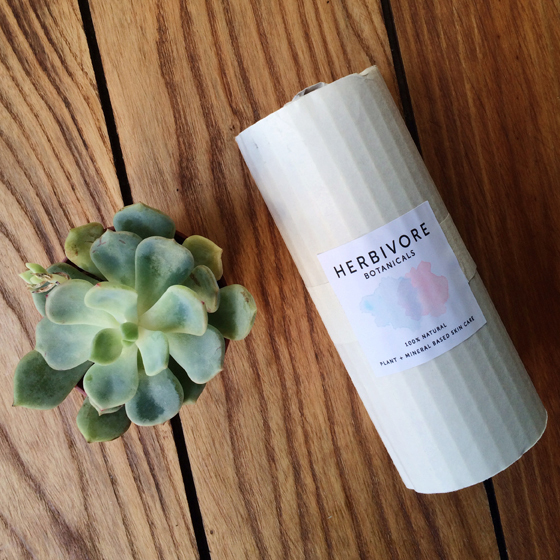 …and for that, we thank you, Herbivore! So. What’s in this baby that leaves the dirt in my pores clinging onto my epidermis for dear life? 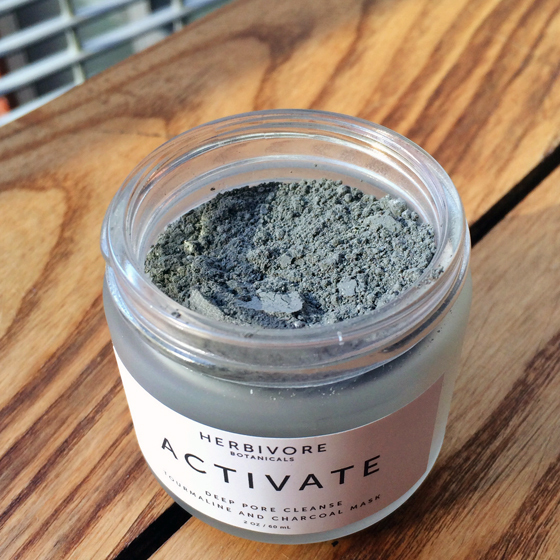 Dead sea clay and activated bamboo charcoal both draw out and absorb impurities from the skin, leaving you feeling super clean. This was my first encounter with tourmaline, which is the first-listed ingredient of this mask: it’s a gemstone crystal that Herbivore Botanicals says, when rubbed into skin, becomes negatively charged on one end and positively charged on the other, aiding ingredient absorption and increasing circulation. Lastly, a tiny amount of essential oils give this mask a subtle scent (jasmine and blue yarrow). If you’re looking for a luxurious mask that provides a serious pore-cleansing, give this one a whirl! Have you tried tourmaline or other gemstone ingredients in your beauty products? Previous Article CeeCee & Bee, a Family Affair: 20% off and DIY Scrub Recipe! I really would like to try this brand! looking awesome ( well..except the darks residues :-)))..
Great reviews! Love the sound of both of these products. The oil sounds delicious I love orange scented products and the mask sounds right up my street. I have heard about using charcoal for blackheads/breakouts etc and it sounds like it works really well! Their packaging is just so chic too, LOVE! Thanks, Amber! You must get yourself some charcoal, lady! It exceeded all expectation. I’m still trying to pinpoint which ingredient it is in the mask that causes such strong dirt pulling…maybe a combination of all three? But my hunch is that the charcoal plays a big part. So powerful! Thanks, Liz! I have been SEARCHING for a review of Herbivore’s blue facial serum – it’s great to hear your feedback on it! I was really close to ordering it just so I could say I had a *blue* facial serum. Clearly, my priorities are in the right place… Aaaand, unrelated, but speaking of gemstones/rocks & minerals in facial care products, I saw your post about your jade facial roller – how freaking cool. Thanks for sharing that! Seriously, it’s totally Fruit Loops — same with the Juice Beauty CC Cream. HUGE fan of them both! I have been using the Michael Todd Organics Charcoal Facial Cleanser for about a week and LOVE it. Now that I am on the charcoal bandwagon, tempted to try this too. Love that we discovered charcoal at the same time…I’ve never felt so *clean. * Must check out that Michael Todd cleanser…I’d definitely like to incorporate charcoal into my daily routine now. Did you find it drying at all? Since it’s Michael Todd I assume it’s pretty gentle? You girls and Herbivore Botanicals! I LOVE the sound of that Egyptian Jasmine body oil–yum. Also the blue serum that Liz mentioned. On my list to try! I know, right? I CAN’T GET ENOUGH. You have to let me know if you try the jasmine body oil, if I get through the neroli scent before summer’s over, I’m ordering that next! Thanks, Tania, you should treat yo’self! The packaging is a little present in and of itself – all of my Herbivore products are proudly displayed on the shelf in my bathroom Not many products make it up on that “pedestal” …ha! Great review! The Deep Pore Cleanse Mask sounds like something I would love using and the Egyptian Jasmine Oil sounds awesome! I’m going to have to check out this brand because I am loving the packaging as well. You really can’t overestimate the value of good design…it goes a LONG way! And there’s so much more to fall in love with on their Etsy page…enjoy + let me know what you pick up! Thank you, Ru! I know, I have a bunch of brands like that…Indie Lee, Caru Skincare and Pollen and Wax…gotta get on it! Right?! I swear, choosing what to order from Herbivore Botanicals is basically like choosing between children. Let me know if you try the white clay mask, it looks like a beaut!